How many articles can RssBook store? How long does it take to sync first? How to speed up sync? Changing subscriptions will require extra time on next sync. For most devices(iPad, iPhone4 later), up to 100,000 articles, comportable use. If exceed over 200,000, start loading time will take too long. Actually there is no limit. Despite increase of start loading time, once loading finishes, article browsing will be fast enough. 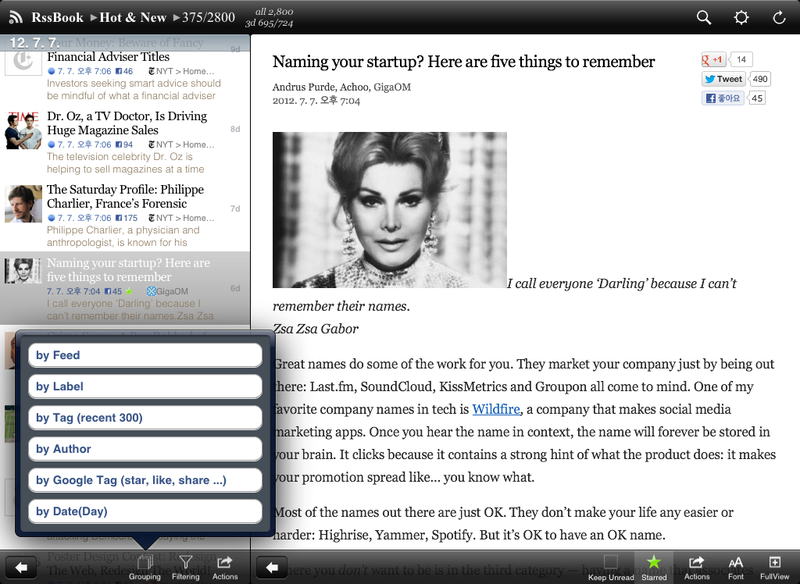 It can varies by device and feed content.Approximately 10,000 new articles per a hour(iPad, iPhone4 later). 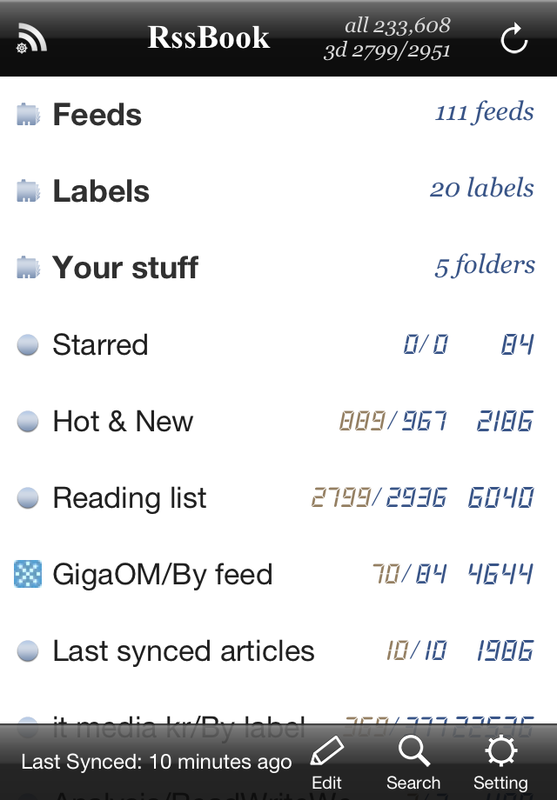 So it will take about 10 hours for 100,000 articles for first sync. RssBook is synced feed by feed. So the number of feeds and sync setting are important. 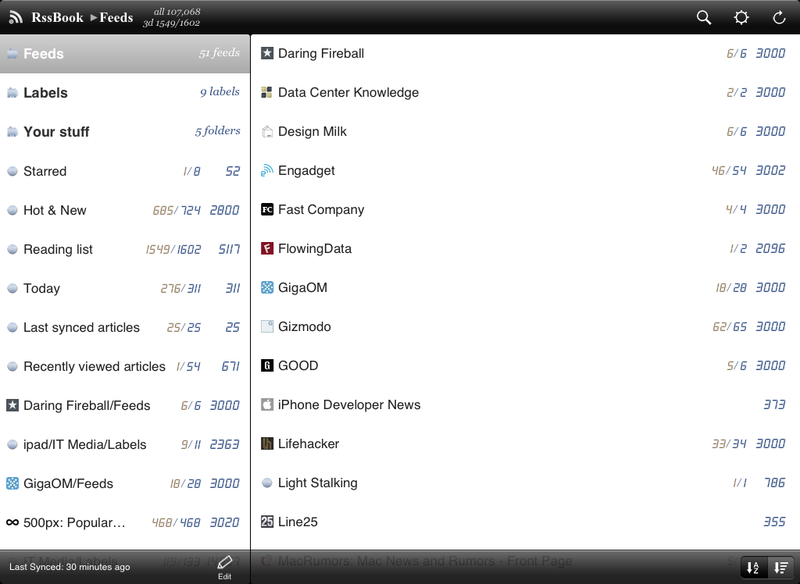 First, organize your feed subscription in google reader. The recommended number of subscription is about 10~50 and not exceed 100. Do not subscribe unnecessary feed. 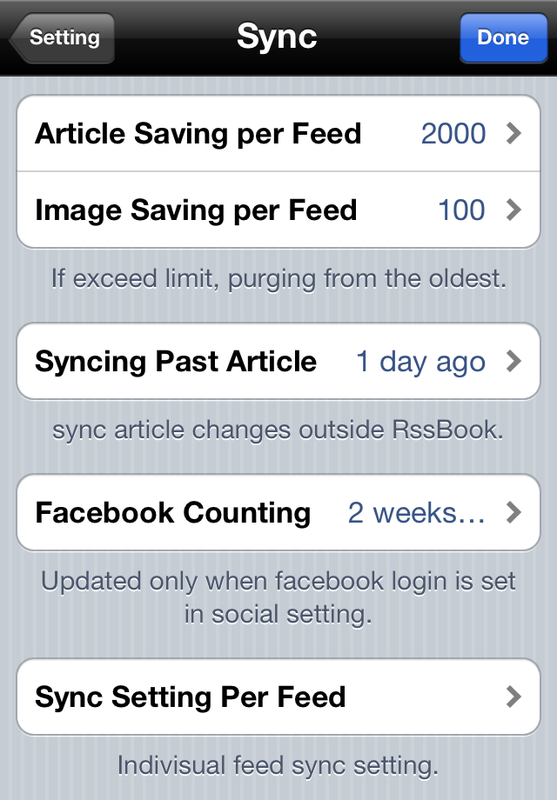 Second, take time on indivisual feed sync setting in RssBook(refer to the next). With regard to device, multicore CPU(iPhone4S, iPad2 or later) will enhance performance. And free disk space also important for speed(at least 15%). gossip blog not worth archieving: very short retention. Long/short retention meanings depends on user’s choice. Generally, regard short as 500~1000, long as 2000~. 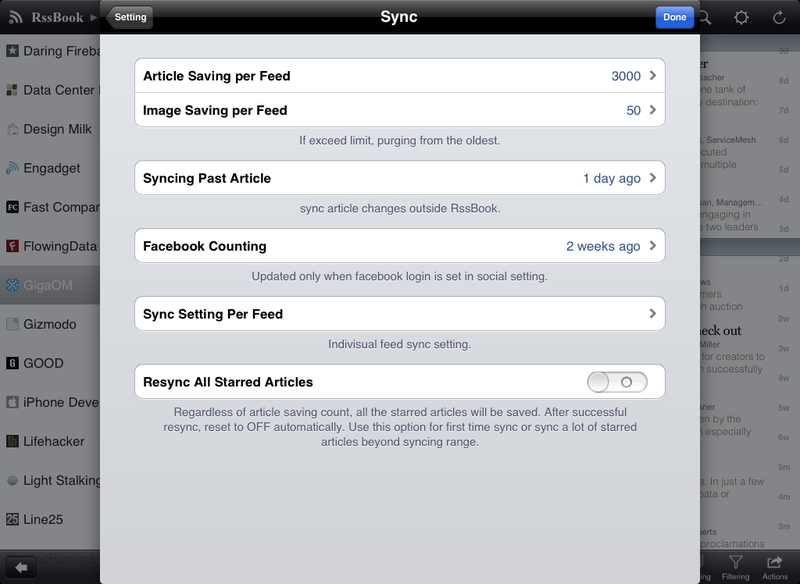 Reduce ‘Sync past articles’ setting value will be helpful to daily sync. This setting decides actual sync range. Originally, intended for syncing article that modified outside RssBook. 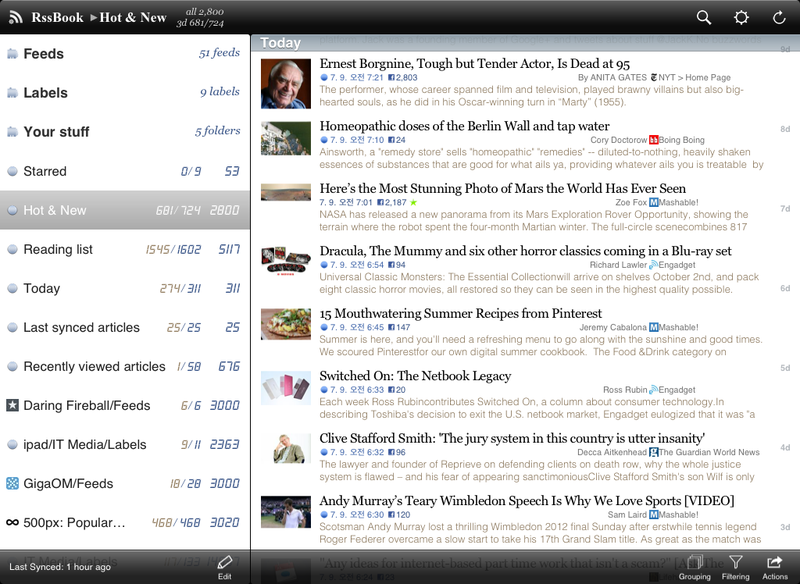 But after google reader deprecate ‘social feature’, it becomes not so important. More often you sync, shorter time it takes. We recommend more than 2~3 times a day. Enabling auto sync is strongly recommended.Default network setting of Auto sync is Wi-Fi connected. After finish first sync, you’d better change it to 3G/Wi-Fi(any network). Article saving count means max saving ‘capacity’ for that feed.When first sync, articles are stored up to that count if available. 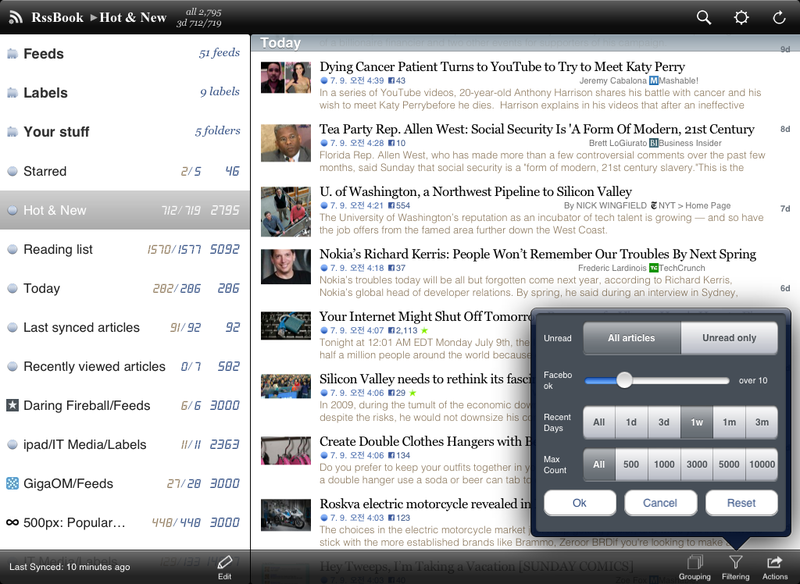 But when daily sync, only new and recent articles are synced. And if newly saved articles cause exceeding capacity, then articles are removed from the oldest by excess count(Purging). 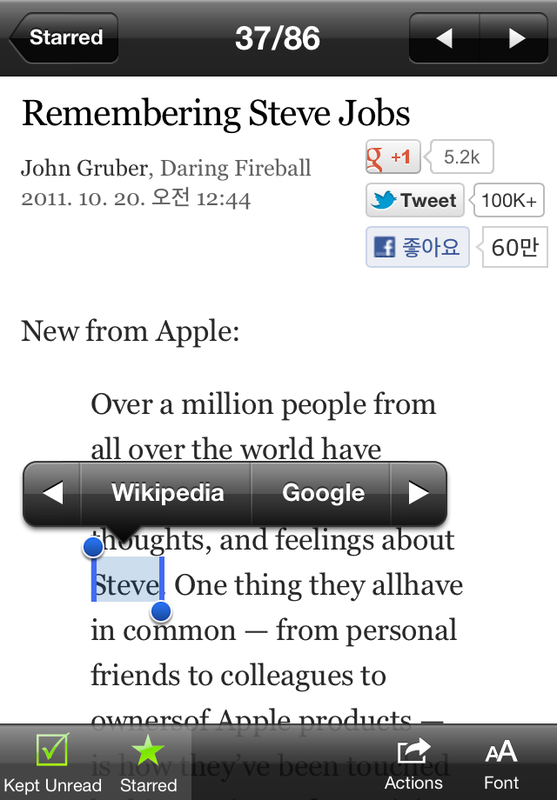 So, once first sync end, even if you increase article saving count, it does not re-download past articles. It only increase saving capacity, which means ‘purging will not occur’. If you want to save past articles after first sync end, use ‘Resync all article’ option. It is located in sync setting per feed, set ‘Use Account Setting’ to no, adjust article saving count as you want, and finally enable ‘Resync all article’ option at bottom. This option is only available at sync setting per feed, not account sync setting. If you subscribe a feed, first sync for that feed will occur on next sync. If you unsubscribe a feed, purging all the articles of that feed will take place.RssBook indexes articles elaborately for grouping and filtering, which require a lot of database works. 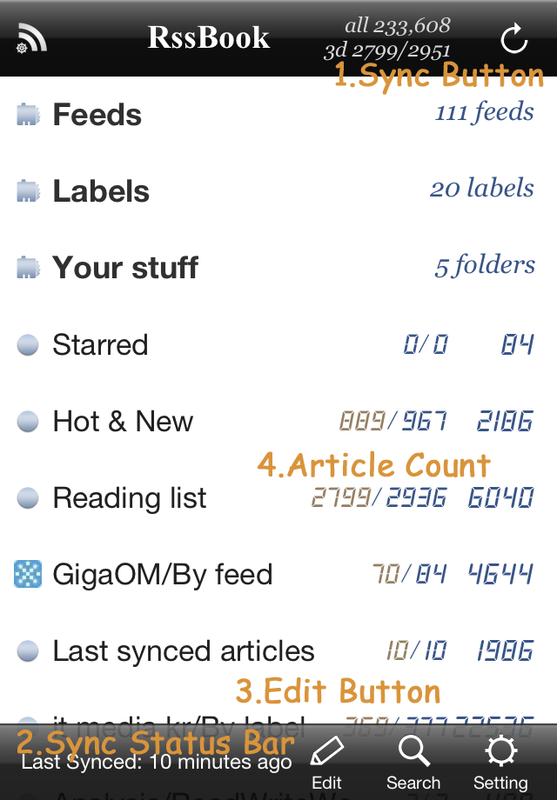 So purging articles is never a trivial job, it take a half of the time that need for new sync. We recommend that subscribing, unsubscribing and organizing several feeds at the same time. After modifing feeds subscription, give sufficient time to next sync. Thumbnail is always searched and generated as long as article has at least one valid image(and if not too big). Generating thumbnail need some internal works and occupies the majority of image syncing time.Images are for two indention. One is for fast offline loading from local disk. The other is image show of that feed. Image show functionality is located in folder action menu. Be cautious in image saving count. Nowaday images are big and some design blog may have dozens of image in one article. So if set too high, it occupies a lot of disk space, which require several giga bytes disk space when you subscribe many image intensive feeds. Note that ad images are not saved and always shown from ad server for blog owner’s rights. More articles, more space. On average, 100,000 articles require about 1GB disk space. 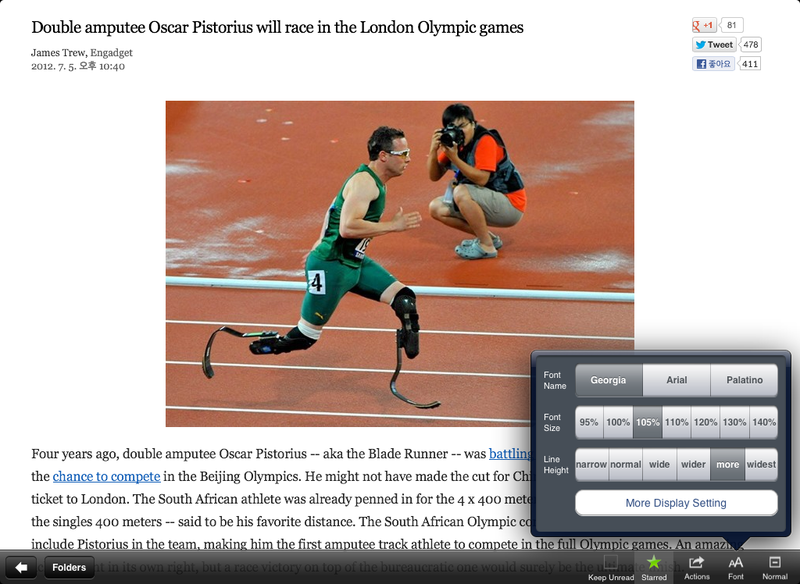 But it can change dramatically depending on article content and image saving option. You can check space usage at account info in setting menu. Watching the value occasionally, you can estimate proper space requirement for your subscription. In addition, low free disk space can hurt performance. RssBook is disk IO intensive and flash disk drive will perform well with enough free space. ‘Add this folder to home’ is located in folder action menu. Every folder can be added to home if not already child of home. It will be helpful to set filtering before adding action. When adding a folder to home, current filtering setting is also saved as default filtering value of newly created folder. By this way, you can create highly customized, extremely useful folders for your own use. While syncing, display current process in detail. When just finished sync, show last sync result. 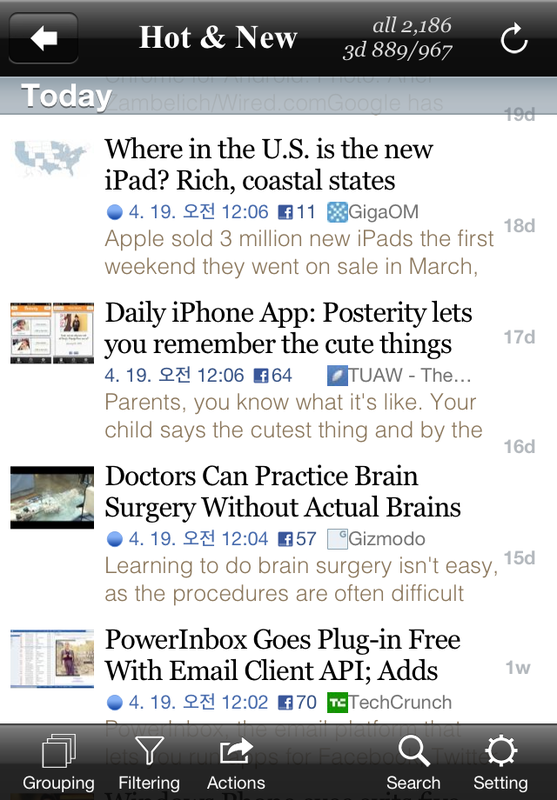 4) Long pressing cell: When long pressing cell, article action menu will pop up. ‘Mark all as read older than this article’ menu will appear only in this popup. Additional,Title tapping: Shortcut to parent folder path and recently viewed article list will popup. 1) Swiping Left/Right: Go to next/previous article. Same effect as next/previous button in navigation bar. 2) Double tap: Double tapping in content area will toggle visibility of navigation bar and toolbar. When user made first scroll, bar will be automatically hidden. 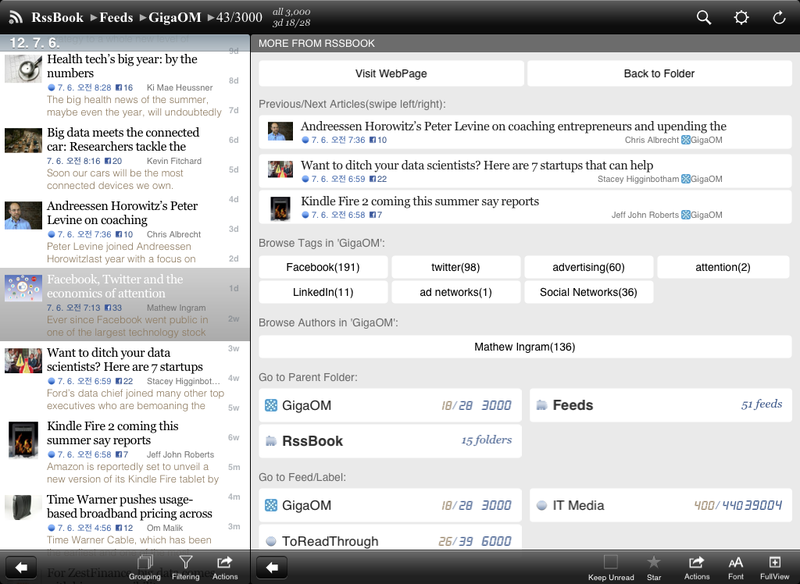 3) Social bar: You can enable/disable this social bar in social setting menu. 4) Long press menu: When long pressing content words, additional menu appear. Updated screenshot for version 1.2.4. Here is RssBook overview video for iPad(3minutes).